Imagine this: the night is dark, cold and raining, while the surrounding grounds and trees are gratefully soaking up the abundant liquid blessings pouring forth from the Heavens above. A few devotees are lined up around Napeshwar, with loving offerings of milk, yogurt, ghee and honey. 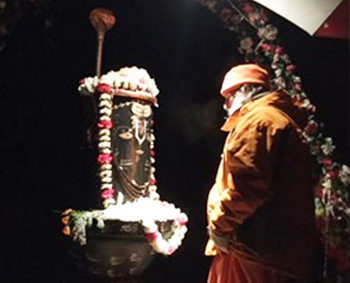 This is no ordinary night, it’s the eve of Maha Shivaratri, Sunday, March 7th, 2016. Some of us take off our shoes while keeping on our socks, which get soaked through and through within seconds. While realizing the futility of our actions, we renounce the socks and brace to embrace the cold, soaked ground. As we surrender to the moment, we find ourselves at once elated and liberated from the prior encumberance. No sooner has the experience started to sink in, who should arrive with their offerings? None other than our very own Swamiji, Master Teacher, embodiment of Lord Shiva, armed with his special brand of wit and humor. I couldn’t help but chuckle and agree wholeheartedly, having just experienced first hand, my own rather uneccessary burden and redundancy associated with soaking, wet, limp socks! The next day, as I was putting on my shoes (and socks), the depth of Swamiji’s words suddenly hit me! A sadhu, Swamiji tells us, is someone who is efficient. Well, we all know that Sadhus travel light and unencumbered precisely because they minimize their needs. This lesson can be extended beyond our tangible and material needs to our emotional and psychological needs as well. So, one asks, what DO we truly NEED, to live a meaningful life? Blessed are they whose needs are few and who can walk bare foot embracing Mother Earth’s offerings in every moment, be it cold or wet, hot or dry. That night, I stood with bare feet on those hallowed grounds and watched in awe, as Swamiji spread His Pearls of Wisdom and gracefully disappeared into the darkness, A BEACON of LIGHT.